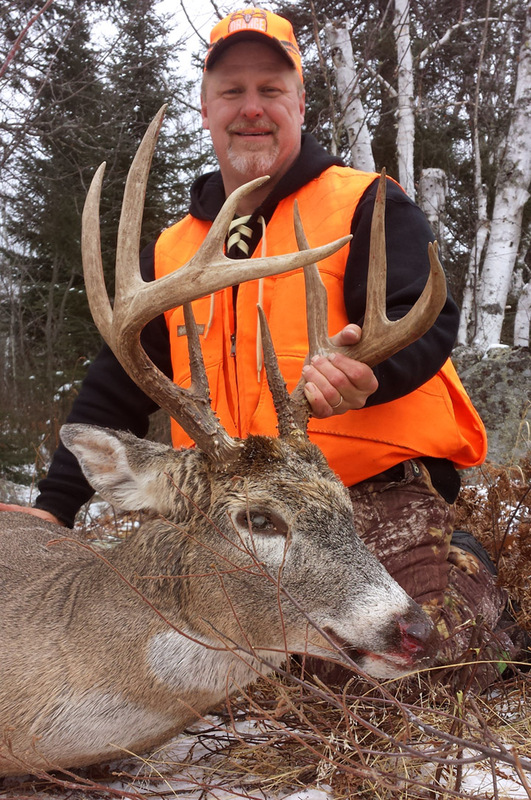 Doc's son Dave with his latest trophy buck. 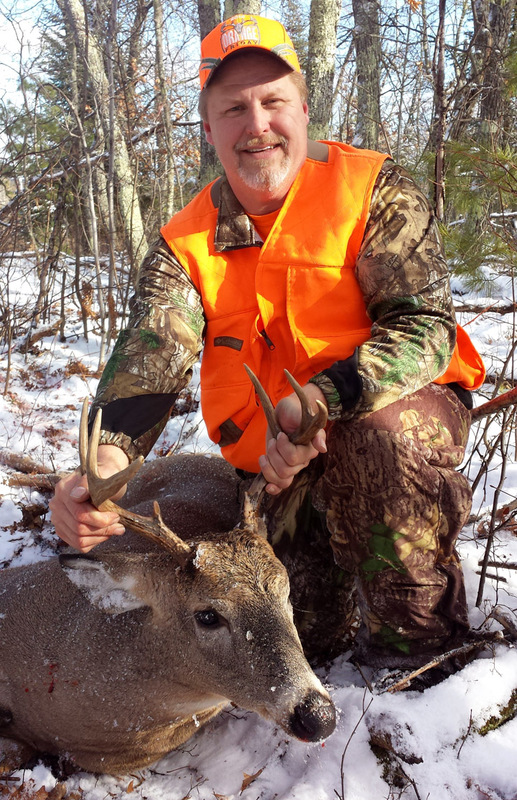 My family of buck hunters and I just returned home from our 2014 firearm deer hunt. 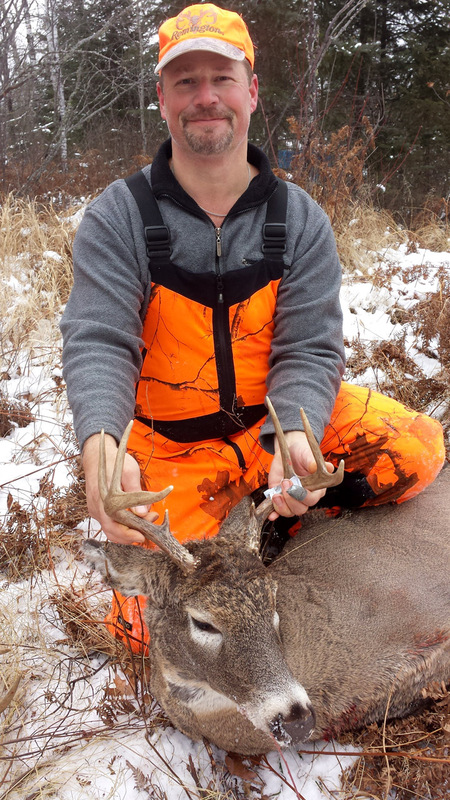 The weather was wretched for the first seven days and we fully expected to take fewer bucks this year because our past two severe winters had greatly reduced the number of whitetails in our far-north hunting area (more than 50%). We nonetheless again took our usual self-imposed limit of four mature bucks, including an outstanding ten-pointer for the wall. Moreover, though more than half of our hunting area was strangely devoid of deer tracks (in snow), most of us watched up to eight unsuspecting antlerless deer and a couple of unwanted forkies pass our stand sites during the nine days we hunted. Three of us had very large, unseen-but-heard bucks (sizes made obvious by sizes of their tracks) pass within 30 yards of our stand sites before first light in the morning. Most of us heard at least one buck grunt during that week (breeding was in progress). This season was fun and exciting for all of us. What made it obvious deer would be active midday that Saturday? From the opener until that Saturday, it had been cold with vicious winds (20–30 mph) that often blew rain, sleet or snow horizontally from the north or northwest. Trees and branches groaned and clattered all week, especially frightening sounds for whitetails during a hunting season. To make matters worse, all-night moonlight or moonlit clouds brightly illuminated the ground with light throughout nighttime hours that entire week. 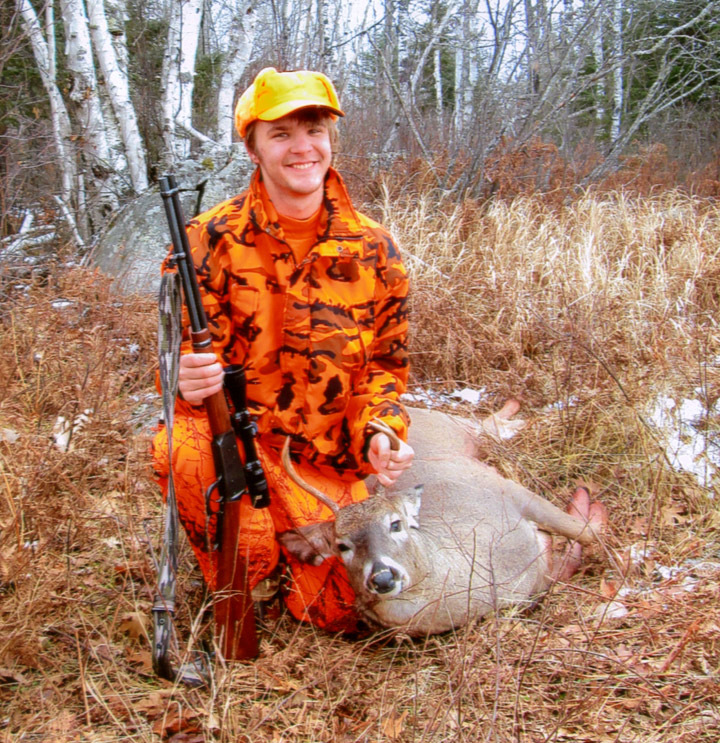 All of this, of course, encouraged whitetails to limit their activities to nighttime hours only. Accordingly, shots were rare anywhere in our region throughout that week (except for two, one taken by my son Dave and the other taken by my grandson, Jimmy, who took his first buck). The next two hours turned out the be some of the best two hours of deer hunting adventure in our memory, even for those who failed to take a big buck (we all saw deer). Of course, actually taking a buck under such circumstances requires more than simply realizing deer will be unusually active midday. All in my hunting gang are stand hunters, some using tree stands and backpacked stools at ground level and others using stools at ground level only. Our stools make it possible to take quick advantage of discoveries of very recently made signs made by bigger bucks or other deer (typically made within an hour) — tracks, droppings, patches where two bucks just fought, just-renewed ground scrapes or railroad tracks (a buck dragging its hooves from track to track in snow, indicating it is smelling doe-in-heat pheromone). If the buck wasn’t trotting or bounding, it wasn’t alarmed and it’s likely very near. Upon finding such signs, we don’t mess around. We immediately back off downwind or crosswind and sit down on our stools where hidden by natural cover to watch and wait. Sometimes we widely circle the area to reach a more desirable stand site. We call this “opportunistic stand hunting.” Sometimes things happen very quickly. Two of the four bucks we took this year were spotted only a few minutes after the hunters sat down. No, it doesn’t always work, but if you are skilled enough while afoot (quiet enough and able to make nearby deer believe you are not actually hunting), experienced enough at assessing deer signs and patient and motionless enough while seated, it works often enough to provide successful buck hunting during up to 8 to 9 of 10 hunting seasons, even in wolf country where whitetails are especially wary and deer numbers are down 50% or more.